There are several types of drinking water dispensers in the market today. Some are entirely made of plastic, while others have glass bottles in the fitting. The choices of drinking water dispensers fulfill needs more than that of quenching thirst—it also fulfills a communal service, hence the availability of many types of water dispensers to suit all needs. Majority of water dispensers are made of plastic. It is the most cost-effective material, and is the most lightweight among the options available. Being plastic, the texture, effect and colors of the water dispenser are as varied as the demands for it. However, environmentalists generally frown upon the use of plastic, which leads to the production of other types of water dispensers. Ceramic water dispensers are also available. These dispensers are heavy and breakable, but the weight balances out the amount of water that has to rest on the dispenser. Aside from the weight, some rural communities still use large clay pots as containers for their drinking water, and the modern ceramic dispenser sort of satisfies the desire to return to the old ways for the modern consumer. A drawback to the ceramic container is that it is more prone to algae and bacterial growth, making it necessary to clean the dispenser every so often. A valuable accessory to water dispensers is a clean hose and a pump that can draw water from a 5 gallon water jug on the floor straight to the water dispenser, which is often about a meter high. This accessory reduces the backbreaking chore of lifting a 5-gallon water jug filled with water to replace the empty ones. A water source is a water source, and quenching one's thirst is similar to a yawn, and just as infectious, too. The water-cooler effect has been observed in office environments as a place for a 1-minute break from work to get a drink of water, and to spend some time making small talk with co-workers. It is a small and quick social event that provides insights into how water can affect an entire community. Tap Water as a Primary Drinking Water Source? 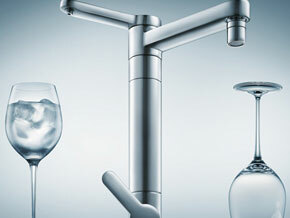 Recently, there have been moves to reinstate tap water as the primary source of drinking water. Especially in the office environment, drinking water has become a huge cost. And this cost happens even as studies are made on the safety of tap water, making the cost of buying purified or filtered water an unnecessary expense. But the studies are heavily reliant on the conditions of water at the locations, so it is best to consult with your water distribution authorities before making any decision with regard to your drinking water sources. And whether it is tap water or purified water for drinking, you will still need a drinking water dispenser not only to provide for the hydration needs of your office or household, but also to reinforce a semblance of a community, even if it is only to drink.